All day he makes me wait. 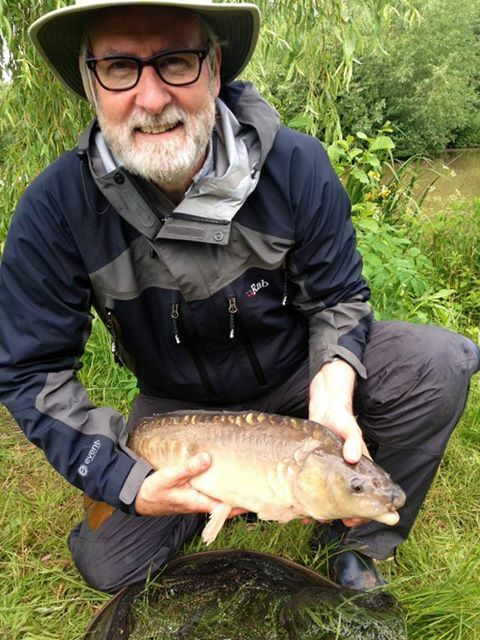 He scorns my meagre bait. Not once in all my days. And cast among the reeds. ‘Cos I am losing face. To catch this noble fish. And grant my fervent wish. He grabs the bloomin’ lot. Like a flash the float goes under. Oh what a silly clot! The hook is in his lip. He won’t give me the slip. He’s heading for the take. From tip to taily fin. That he is all done in. And get him on dry land. 8 lbs, says Pete, I’d like to bet. Here let me take your hand. The biggest fish… since you were born. During our week at Uley (see last post) Alan Woods, a fellow-member of the Artful Leadership Collective, suggested that we explore the embodied nature of our knowing by drawing life-sized outlines of our bodies on huge sheets of paper and then intuitively illuminating them with colour. It was a brilliantly simple and profound exercise. The images quickly took on the unique form and character of each artist, revealing our life-and-death relationships with our own fleshy bodies: shimmering lines of energy; wildly imagined limbs; looping twisted guts; pierced bloody organs; flowing lines and harsh sudden marks. When they were all finished, the whole group explored the aesthetics and meanings of each self-portrait. The discussions were surprisingly intimate as our sense of embodied selfhood revealed itself subtly (and sometimes dramatically) under our collective gaze. My image was likened by someone to that of the Cerne Abbas giant – although without the club and obvious erection – and I did indeed feel disconnected from it, unable to inhabit the distorted pain-filled body I had drawn. 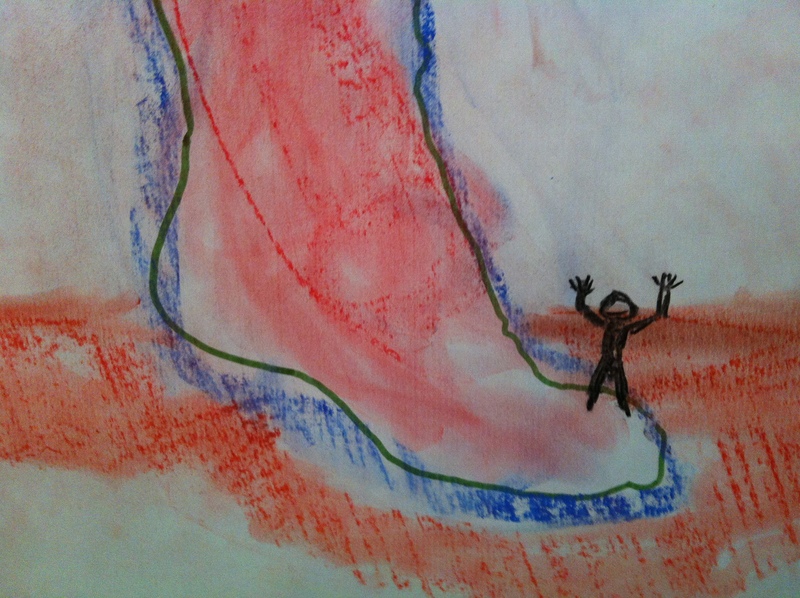 I added the small figure of a man standing on the giant’s foot; “I’m alright,” he seems to say. “I’m real. This other thing is just a projection.” He feels somehow more substantial and larger than the giant; he gives me a voice that enables me to reclaim myself. I like this defiant, life-affirming, articulate part of myself. Towards the end of our time together, the group created a “word-hoard” – nouns, verbs, adjectives and adverbs – on separate pieces of paper that we laid out on the floor to make a single poetic statement about the experience of embodied image-making we had shared in the previous 48 hours. Some of us (the 5 men as it turned out) then drew on what we had collectively created to write individual poems. Here they are, strangely beautiful, with sincere thanks to fellow artful inquirers: Alan, Bethany, Chris, Doug, Ellie, James, Marcelo, and Sarah. in a majestic patterning dance. as the spirited ground spins free. I joyfully know my grounded fleshy heart, skin deep and with deep, majestic flesh. Be bold, moving through shadow to a spirited darkness and a glowing glee. Through vital mud, tiptoe to me. when darkness radiates and floods the heart. Witnessing presence, sets compassion free. Grounded spirit, emerging healing, majestic life. as the people who have lived these lives? How can we live present to loving purpose? I’ve just spent a fascinating week in Uley (Gloucestershire) with my partner Chris Seeley and 7 other friends and colleagues from the Artful Leadership Collective exploring our practices as teachers, leaders, facilitators, consultants, artists, storytellers, writers. On the second day we considered two main questions: What does it mean to live and work artfully; and what is our relationship with our own practice? We began by making images in response to the questions before discussing them. Using my intuition rather than following a preconceived plan, I drew the picture above. 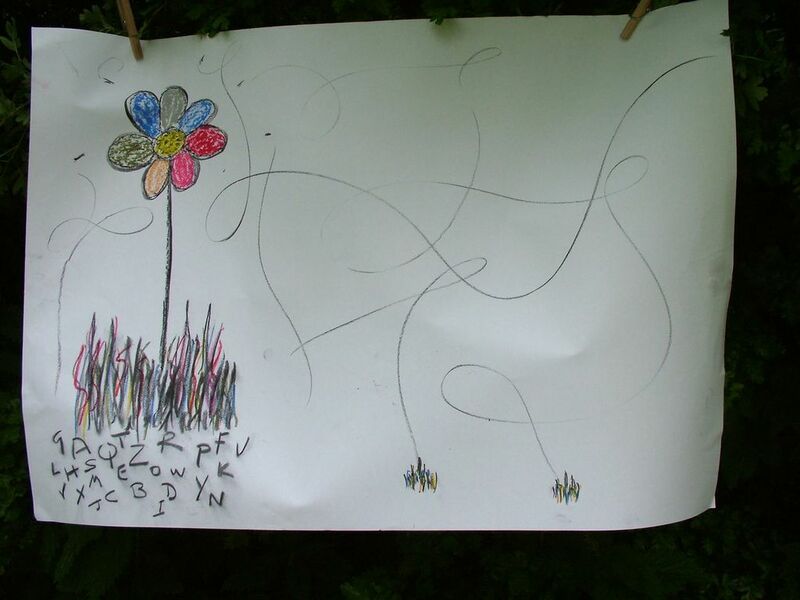 The flower came first, rising out of multi-coloured foliage; then the seeds blown on the wind and settling beyond my ken; last the randomly distributed letters of the alphabet. A key idea to emerge as we interrogated the images to see what they revealed about artful practice was that of “wilding” – of stepping outside the neatly cultivated conventions of the system-world to revel in the abundant fecundity of the life-world. We realised that in different ways, we all invited our clients to recognise and trust their own wild beauty and intelligence. My picture reflects an aspiration to re-enchant the world through language, scattering my words like wild flower seeds in blogs, books, storytelling performances and workshops. I’m more naturally a wordsmith than a visual artist, so I’ve turned to poetry to portray what I think about the joys of living and playing outside the garden. All the flowers just the same. That our nature’s to be wild. Living where they don’t belong. Let the heart speak, let it yearn. Let the spark of wildness burn. Bask in sunlight once again. In 1997, like millions of others, I went to the cinema to see James Cameron’s epic film Titanic. I sat unmoved as Leonardo di Caprio and Kate Winslet went through their romantic shenanigans but driving home afterwards, I suddenly found myself weeping for the needless folly of it all. Why hadn’t the captain and crew turned the boat sooner? Why had they disregarded the warnings? Why had they all been so besotted by their own myth that they hadn’t seen disaster looming? I was reminded of this moment recently, reading page 100 of Thomas Berry’s book The Great Work, a meditation on the state of our planet and a call for action. Long before the collision those in command had abundant evidence that icebergs lay ahead. The course had been set, however, and no-one wished to alter its direction. Confidence in the survival capacities of the ship was unbounded. Already there were a multitude of concerns in carrying out the normal routine of a voyage. What happened to that “unsinkable” ship is a kind of parable for us, since only in the most dire of situations do we have the psychic energy needed to examine our way of acting on the scale that is now required. The daily concerns over the care of the ship and its passengers needed to be set aside for a more urgent concern, the well-being of the ship itself. 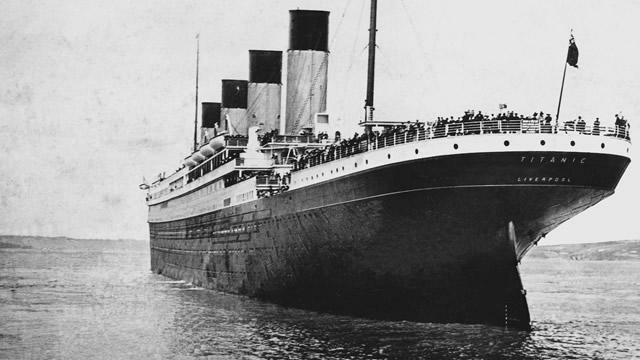 Berry’s use of the Titanic metaphor piqued my interest so I trawled the internet for some more historical details of the actual event. I read the stories of survivors and of some who had planned to make the voyage but had changed their minds for various reasons: family affairs, illness, urgent business elsewhere, etc. My favourite “missing the boat” story was that of a certain Mr. Frank Carlson who, at 8.10pm on Wednesday 10 April 1912 as the Titanic slipped its moorings at Cherbourg, was standing at the side of the road 5O miles away kicking the tyres of his broken down car in frustration, a first class ticket for New York in his back pocket. Of course, we cannot miss the boat or jump ship. For good or ill, we are all on board and there are no lifeboats. There will be no lucky escapes, no survivors, if our ship goes down. I don’t know if there is yet time to avoid the iceberg but there’s no doubt that we are still going full steam ahead and it’s pretty clear that those on the bridge aren’t listening to the warnings from the crow’s nest. We first class passengers, in the industrialised world, wrangling over our perquisites and privileges aren’t making life any easier. It’s time for us to take more interest in where we are going and to decide that rearranging the deckchairs to get a better place in the sun is not our main priority, for there’ll be no-one left to weep at our folly if we don’t.